These free romper patterns for girls make adorable summer outfits! When I was a girl, I owned a lot of rompers. They are perfect for summer because they are easy to slip over a swimsuit and great for keeping cool. If I remember correctly, I had one that was off-white and had little lilacs all over it, and it was one of my favorite ones. I loved the color purple as a kid. Making rompers is fairly easy to do and you can make them quickly from just about any material. 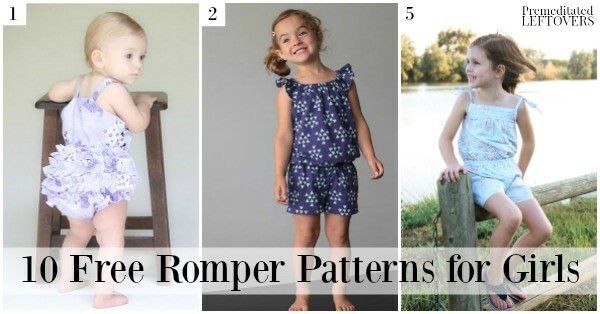 If you have a little girl in your life you are wanting to make some summer outfits for, check out these 10 free romper patterns for girls. 1. This Ruffle Romper pattern from Melly Sews is so cute! There is nothing more adorable than a little ruffled diaper behind! 2. This Flutter Sleeve Romper in size 4T is so adorable! I love how It's Always Autumn made this one look like it is almost 2 pieces. 3. Going with the ruffle theme, check out this adorable Ruffled Romper tutorial from Blooms and Bugs. I can't imagine anything more precious for summer pictures! 4. Big girls like to wear rompers, too, and this Big Girl's Romper from Crafterhours is made to be like the ones you see at stores like Urban Outfitters. 5. Make It & Love It has a great tutorial for a Little Girl Romper that uses a pair of shorts as a pattern, so you can make it in any size. 6. This cute Skirted Pillowcase Romper from Create Kids Couture is perfect for the girl that loves anything that is over the top girly. 7. Every little girl needs a simple Pillow-Case Romper and this tutorial from Infarrantly Creative is a great tool to learn how to make your little girl one. 8. Check out this Shirred Bubble Romper from Mama Says Sew. It's so playful! 9. This Free Romper Pattern from Nap Time Creations is great because it is available in 4 sizes from 0-12 months. 10. Sew a Straight Line features a very cut Ruched Romper that is perfect for little ones still in diapers. What a great collection of patterns! I love all the sweet fabrics out this summer – perfect for my little girl but sometimes I just don’t know what to make with them. Rompers are the perfect answer. They are wonderful for summer. Pinning to make later! What a collection. Thanks for featuring my ruffled romper.